Add a unique and customized styling as well as lens protection to your BMW F30 3-Series headlights with these Lamin-x headlight covers. Lamin-X is designed to protect your car from road debris, such as rocks, as well as adding to the look of your vehicle. Adding Lamin-X to your headlights is an easy way to improve the overall appearance without much effort. Depending on the look you are going for on your BMW F30 these Lamin-x headlight covers are available in 5 colors: clear, tint, gunsmoke, optic blue and yellow. 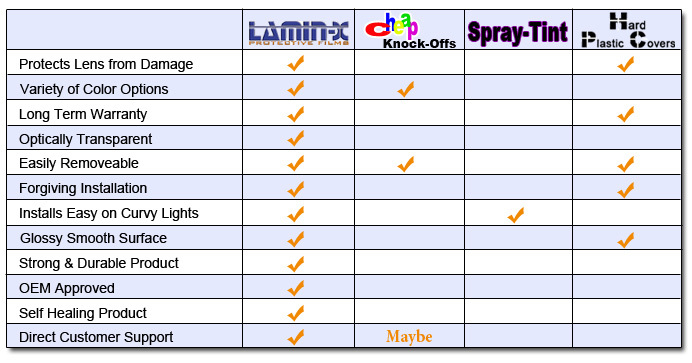 Lamin-x Protective Films guarantees its products for five years from the date of purchase. The products are guaranteed against defective materials and workmanship, this guarantee is null and void if the products have been improperly handled or applied. Neither the seller nor the manufacturer shall be liable for any injury, loss or damage, direct or consequential, arising out of the use or inability to use the products. If the products are not proven to conform to specifications the seller's and manufacturer's obligations shall be to replace it at no cost to the purchaser. All expressed or implied rights, warranties, guarantees, or conditions, stutory or otherwise, are excluded. The foregoing may not be altered, except by agreement signed by the buyer and seller, and is void where prohibited by law. During the five year guarantee period, your Lamin-x Protective Films product will be replaced free of charge, when proof of purchase and the defective product are returned to the seller or the manufacturer.